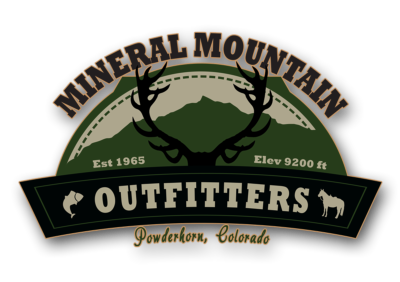 ​Mineral Mountain Outfitters offers a unique variety of high altitude fishing adventures. Whether fly or spinner, river or stream, our beautiful mountain scenery and pristine waterways will afford you a fishing experience unlike any other. Here, you can find small fish-filled streams and creeks nestled deep in the wilderness and fed yearly by snow runoff. Several species of fish call this area home. The most common in the smaller streams and creeks are the Brook Trout. Slightly larger in size and found in larger creeks with more food supply are Brown and Rainbow trout. In certain areas you will also encounter Colorado's state fish, the native Green Back Cutthroat. The Green back Cutthroat is a threatened species, so we are unable to guide/outfit any parties looking to catch this species of fish. Choose to fish from remote areas or more easily accessible locations, all on public land. Travel to your destination by either horseback or vehicle, depending on the location. There is a multitude of stream and river choices in the Gunnison National Forest and La Garita or Powderhorn Wilderness areas. Brook Trout are a smaller trout with white tips on their fins (except dorsal), living in clean, clear stream fed water. These fish are native to the northeastern midwest states, but have been relocated to many different areas across the country. They prefer deep pools or seams of water. They hide underneath rocks, along the bank, or other natural protective obstacles. Brook Trout eat a variety of different waterborne and land insects and are known to eat other smaller fish and crustaceans, as well. Rainbow Trout are easily identifiable by the broad pink/red stripe that runs down their body and the black spots covering their dorsal region. They enjoy rivers and creeks that have abundant natural vegetation, which provides shade and protection for hiding. These fish are natural predators and their diet largely consists of other smaller fish and crustaceans, although they also feed on insects such as the Caddisfly, Mayfly, and Stonefly. Brown Trout grow to be a little larger than Brook Trout in this region, and fishermen will tell the difference upon hooking one. Brown Trout are originally from Europe so they are not native to the United States. Brown Trout eat a variety of waterborne and land insects, also feeding on smaller fish and the unfortunate field mouse that slips into the water. Brown Trout are known to be an aggressive fish, protecting their area from intruders. Therefore spinner fishing this species can be a rewarding experience. The Greenback Cutthroat is native to many Colorado streams and rivers. Though it was once believed to be extinct, this beautiful fish has found its way back into some of its natural habitat in Colorado. Greenback Cutthroats can be identified by the dark spots that cover their body and the blood-red coloring on either side of the throat. This threatened species of fish require similar habitats and food supply as Brook trout.